SYDNEY (Reuters) - Private equity giant Blackstone Group <BX.N> has quit a takeover battle for Australian office-block owner Investa Office Fund <IOF.AX> after it was gazumped by Canadian landlord Oxford Properties Group's A$3.35 billion ($2.4 billion) bid. Blackstone told Investa it would not match the offer, Investa said on Thursday, all but handing the sought-after target to Oxford as office rents boom, especially in Sydney where Investa's 20 towers are concentrated. With Investa's board now recommending the Oxford buyout, notwithstanding a better offer, it also ends a takeover battle running since the Canadian firm emerged as 11th-hour contender last month. "There's only the formalities to go through. I think that's as high as it'll go," said Winston Sammut, managing director of property investor Folkestone Maxim Asset Management. "The question really now is what does Blackstone do given that it's got some cash available." A Blackstone spokeswoman declined to comment, as did a spokeswoman for Oxford Properties Group. "This is an excellent opportunity for IOF unitholders to crystallize their investment in IOF at an attractive and certain price," IOF Fund Manager Penny Ransom said in a statement. The transaction, which requires shareholder and regulatory approvals, comes as tight supply in downtown office markets is driving a slew of deals in a sector that is defying softening home prices in Australia. British-based consultant BIS Oxford Economics, unrelated to the bidder, forecasts vacancy rates for Sydney offices to hit an all-time low of 3 percent by the end of 2019 and office rents to rise 56 percent over the next five years. "Some people think this is over, but it's not," Frank Gelber, economist and a director at BIS said by phone. "We reckon this cycle's got another four to five years to run." In other deals, Miami-based Starwood Capital has three times raised its offer for Melbourne-based landlord Australian Unity Office Fund <AOF.AX> to A$480.4 million. Industrial and office landlord Propertylink Group <PLG.AX> on Tuesday dropped its A$755 million bid for peer Centuria Industrial REIT <CIP.AX> while it mulls a A$732 million takeover offer from Warburg Pincus [WP.UL] controlled ESR Real Estate. Investa, which first drew interest from Blackstone in April, and a A$3.08 million bid in May, is regarded a particularly valuable because it is the largest office owner not diversified into the weaker-performing residential or industrial sectors. Before Oxford emerged as a spoiler two days before shareholders were set to vote on Blackstone's buyout, the private equity giant had already lifted its bid once. It raised it three times before Oxford beat it out by A$48 million. Investa shares closed 0.36 percent lower, in a flat market, at A$5.55, just below the Oxford offer price of A$5.60. Oxford's offer will be voted on by shareholders at a meeting to be scheduled in December. 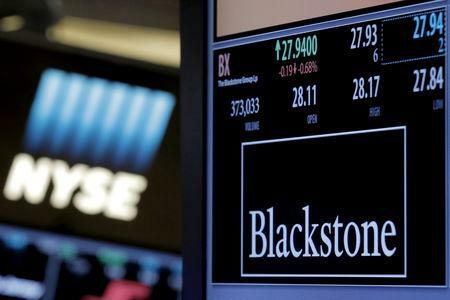 Investa must also pay a break fee of about A$32 million to Blackstone.